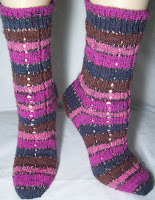 Cross Purposes got finished Sunday (not Saturday)--and I immediately cast on another pair of socks.. 2 pairs, actually. Pair 1 is yet another one Patons Kroy—Tangerine color way—a lovely blend of pastels. They are being knit top down, with a fancy cuff, and then stocking knit, letting the jacquard stripe pattern of the yarn do the work. The tangerine orange is just a pale orange with just hint of coral—mixed with blue and green and a touch of shell pink. The colors make them a good fit for my “socks to match clothes' goal! These will be my knitting to and fro and at work socks. Pair 2 is machine washable wool, worsted weigh, being knit on size 5 needles, toe up. A pair of bed socks for foot care package that will be a fundraiser for DD Avon Run Walk. The needles feel huge! These will be a fast to knit pair of socks--my at home project. When not knitting socks, I am documenting how to knit them—I want to do more of this—for sock and for other designs. A few years ago, I had a similar obsession with hats for a while. I noticed it, but I didn't worry about it. After a zillion hats, I got over it. I documented directions for a number of hats—and I want to organize these too. Tonight, my plan is to wind up all the skeins of Saturday's sock yarn stash. I might (should I?) go back and get another skein or two.. It would be nice to have both socks and shawl in the blue. But I am afraid if I do, I'll find some other yarn that will force its self into my stash—a stash that is SABLE—(Stash Accumulation Beyond Life Expectancy!) made partially for 2 former knitters SABLE. It's a wonderful stash—I really should knit it, and not buy more yarn. I knit fast, but I can buy yarn so much faster than I can knit it.. I need to keep out of Smiley's when they are having a sale. But in the grand tradition of sock yarn not counting as part of stash, sock yarn I can justify buying, since there was no sock yarn in the SABLE I've inherited. Mohair, yes, Noro, yes, smooth wools, yes, thick and thin wools, yes, angora, yes, silk, yes, but sock yarns? NO. And since sock yarn doesn't count; well, no guilt! Speaking of denim (as I did above) I stopped at a garage sale and got a bunch of fat quarters --in various shades and weights of denim. Some dark, heavy weight and stiff, some softer and faded, but just as heavy a cotton, and others in a soft and drapy cotton that is a light weight denim--in both light (fade) and dark denim blue. A real mixed bag--a very cheap bag, too! The crafter had planned a denim quilt--so there are just a few of each color/weight-but I have a plan. It will just take a few of the fat quarters to make a long, gored skirt yoke (and pockets.) Then the skirt will be finished(ie made a decent length!) with a handkerchief hem of bandanas. I might end up 2 or 3 similar skirts--since bandanas come in so many colors! (and I have enough fat quarters to make a few yokes!) a matching bandana worn with a T or a camp shirt (I have lots of them.. remember?) and it will border on being a too matchy-matchy outfit. But still the price is right, and they will be easy enough to make! Long, long ago, (when bandanas sold 4 for $1!) I made a dress from a dozen--and loved it. I am older, and bandanas are now $1 each--but I think I will be just as happy with these skirts--I really have to get back to sewing! Sounds like a fun weekend! I'm currently planning sewing projects as soon as we get our sewing room put in. We seem to have similar inspirations. I also have some denim stashed - but I want to use it to make patch work blocks - to hopefully be incorporated into a jacket. Wish I had more time to create.